I truly believe that those who live by a well-defined motto (or set of mottos) have a great advantage over those who don’t. Our mottos become guide posts and verbal beacons along the road we travel. They are the street names on the map of life. 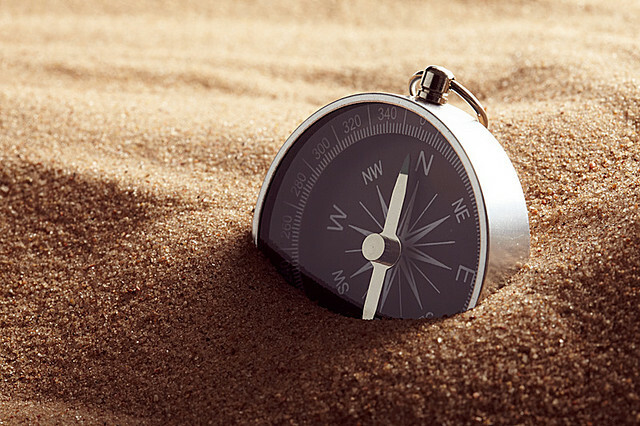 They are the rhetorical equivalence of a compass to help us get our bearings and stay on course. They also reflect the heart of our hearts. They are terse statements of deep value, of what we aspire to be. They also help teach the fundamental ideas we want to pass on to others, especially our children. Some mottos are grand and sweeping statements about core values. Such are broad life-mottos. Others are shorter situational-mottos, better applied to specific circumstances. I have several of these shorter mottos I’m willing to lend you for a while. If you take good care of them, maybe I’ll let you keep a few. Life is a classroom, a teacher of universal principles. The process of living is equivalent to the process of attending class: It is intended to instruct. Therefore, expect lessons to be taught, and tests to be given and some of those tests to smart a bit. In other words, don’t sweat it; Learn from it. Take the lesson from the situation and let the failure, the disappointment, the frustration, fade away. In the end, the spilled milk is only spilled milk. The misstated word is only a word. The traffic jam is nothing more than that, a traffic jam. No big stinken’ deal! “Live and learn” becomes the verbal tool I use to refocus my thoughts. By focusing on the lessons life is trying to teach us, we resent it less when life’s tests include rocks and stones thrown our way. We realize it’s not trying to hurt us as much as trying to teach us something only a stone or two can get us to see clearly. Many people lose the lesson in the pain. They can’t retrain their eyes on the what they’re being taught. This motto helps. This is a motto I may overuse (and often use in conjunction with “Live and Learn.” It’s one that’s true, but not always appreciated by those who feel in the moment that what I’m verbally downgrading IS a big deal to them. Nonetheless, there are innately big deals in life. Births and deaths, job losses and serious injuries and the like fall into that category. Most other things are relegated (in my mind, anyway) to the level of “no big deal.” So the TV program got cancelled. So the green light skipped us. So the lady in front is taking too long. Really, in the larger scope of things, is it really that big a deal? Just the other day my son was telling me that he saw a boy in the gym with only one hand, that his other hand was half missing, smaller than the other, and attached to a stub of an arm. More recently, my 5-year-old son came home from school and spoke of being shorter than his friends. My response was the same as with the one-handed boy at the gym. His answer was heartening. He giggled at the thought of me not knowing which little boy was mine and nodded, “Yep, no big deal. We’re all just the right size.” He’s heard me say that before too! Ah, the power of a repeated motto! But be careful not to get in the habit of justifying bad behavior and excusing laziness and inertia with a flippant “No big deal” for things that are big deals. So be warned and use this motto with caution. If rain starts to fall on the picnic or no one shows up to the party or the store is closed or the park was more expensive than we thought it would be to enter, my family will often here me say, “Well, it is what it is.” We’ll then change plans and do something else. It is a way to accept the frustrating, to deal with the disappointing without letting it ruin the day. It isolates the moment, then accepts it and tucks it away. It then allows me to look anew at the newly developed circumstance and choose another response, another course, perhaps a better one. My use of this motto is sometimes preceded by my “no big deal” motto. “No big deal” places the challenge or the disappointment in context. “It is what it is” accepts the reality of the need for a change of plans divorced from negative feelings about the need to change them. It keeps attitudes positive when circumstances may otherwise be perceived as negative. This, of course, applies to those things I have no control over (such as the weather and others’ behavior). This attitude can be the slow suffocation of growth and improvement applied to other controllable things of high priority. 1. It redirects my thoughts, thereby minimizing the pain. There’s nothing that focused attention doesn’t make bigger. Learning to ignore some of life’s uncomfortable moments helps us enjoy life a little more, given its fairly frequent dose of discomfort. 2. It sends a message to my nervous system that overwrites the importance of the discomfort, allowing me to continue doing what needs (or I want) to get done. I don’t wallow in the pain. I recognize it. See if there’s something I need to learn from it. Then ignore it. 3. It also teaches and reinforces a larger life lesson: Pain does indeed pass. It fades and over time, goes away. Emotional pain does too. “It’s just pain” helps place pain in a larger, broader context, with a more distant-looking perspective. Pain – or the fear of it – stops too many people dead in their tracks. They retreat and hide and wrap themselves in the tourniquet of fear. Adopting this motto would be a good idea for those stuck in their pain. But internalizing this motto helps reduce its painful impact in the first place. Some people fall to the ground, wallow in misery and dwell on the pain, letting everyone else know in vivid detail just what they’re going through. My motto keeps me from that kind of self-indulgence. The words we use not only reflect what’s in the heart, our words help put things in the heart. Our words influence and school the heart. When we think carefully about our values, condense them into a terse, repeatable statement, our words become focused and concentrated. And therefore, more effective at instructing the heart of the values we hold dear. And over time, we learn that pain does, in fact, go away, that what we look like doesn’t matter, that not everything we don’t like is a big flipping deal, that sometimes it’s better to change perspectives than circumstances, and that, indeed, we are all here together, stumbling in the dark, trying to make sense of it all, learning one day at a time. Do you have sayings or situational mottos you use regularly? What do you think of the ones I mention here? I would also LOVE it if you haven’t yet subscribed to get updates, my newsletter and my free eBook, A Walk through Happiness, for you to click here and begin getting that bounty of happiness-producing material! I’ve been told it’s pretty good stuff! Keeping the big picture in mind, and remembering that most things truly aren’t a big deal is great for your overall happiness and well-being. Thank you for sharing that with me today as I am having some technical difficulties. It is just what I needed to hear 🙂 Love when that happens. is one of my favorite personal catch phrases. It re-frames the situation & puts it into the proper perspective. Hi Connie! You said it exactly right, better than I did: “It re-frames the situation & puts it into the proper perspective.” That’s exactly what it does! Thanks so much for sharing your thoughts on the topic! Thanks for sharing these motivating mottos Ken! A feel a common thread running through them is – you can’t control what is out of your control, so only worry about those things you can! What will be, will be and usually, it all works out well. My pleasure Kat. They were fun to write about. You’re right about the common thread. Thanks for noticing that. So many people get so overwhelmed by parts of life they can do nothing about. I like the Alcoholics Anonymous prayer that asks God to help them change what can be changed, accept what can’t be, and to be able to tell the difference between the two. There is wisdom in that prayer! I totally relate to the first 3 motto’s. I find that I use those quite often myself. The 4th…well…since I live with chronic pain daily it’s more of a challenge. I try to focus or imagine myself well. Sometimes, I’m really good at it, other times, not so much. I think I’ve determined that my personal motto is, “In the end, only Love matter”. At least, that seems to be the biggest lesson so far. Yeah, I see how #4 wouldn’t work for you, at least not the second part. I wonder if having an “it’s just pain” detached attitude toward your chronic condition would have any positive effect. Just wondering. “In the end, only love matters.” That’s a good motto, Marianne. I agree. These are all great mottos that basically say to accept things the way they are because you can’t control them. It’s amazing how much suffering we create for ourselves by trying to control the uncontrollable (and almost everything is uncontrollable). There’s no way we can be happy until we let go and accept everything and everyone as they are. My version of it is: So what? So what if my world is falling apart around me? It’s creating space for something new and fabulous! What an awesome attitude, Paige! Haha! My crumbling life is creating room for something better! I like that! It trains our minds on the opportunity our challenges present instead of the pain associated with it. We do try to hold on to life and squish into the palms of our hands or down into our packets and let it out on our own terms only when we’re good and ready for it though. And what a frustrating illusion that is! Thanks so much for the insight and wisdom of your words here! What I especially like about these mottos is their common theme of helping us not get hooked into our own dramas, the stories we tell ourselves about whatever is going on. Like Paige, I’ve often used the phrase, So what? Thanks for loaning us your mottos! It’s so easy to get hooked on all our little dramas, isn’t is? That’s why these mottos have served me so well. They pull me back away from the heat of the moment to see what is actually happening, with a broader perspective, eyes wider, vision clearer. I’m a big believer that life is short and that we have to stop and smell the roses, but I have also learned that life is long when it comes to all of the changes I want to make to my life. Rather than the New Year’s resolution approach, which usually results in failure, frustration, and stress, if I slow down to make changes, focusing on one thing at a time for the 21 days it takes to form a habit, the result is real, lasting change. Thanks again for the post and for all of your good work. I really appreciate you stopping by and leaving this comment. You make a couple real important points with your unexpected motto! Life is short, so we should be anxiously engaged in doing good, in learning and growing. But you’re right to remind us that life isn’t a race either. We’re not trying to pass some finish line first. One habit, one trait, one day at a time works, and works better than trying to change and learn everything at the same time. It is what it is…that’s a big one for me. It goes along with don’t sweat the small stuff, and its all small stuff. Whatever is happening at any one time is what I have to work with. So, that’s what I do. If I can’t change it, I work with it (whatever it may be). Great post! Nea | Self Improvement Saga recently posted … A To-Don’t List for a Happy Life: What Not to Do! Great comment, Nea! I love that line: “Don’t sweat the small stuff.” I really appreciate the distinction you make too: “If I can’t change it, I work with it.” Wise words. There are things we can change and in those instances, to use my motto would be nothing short of an excuse to stay as I am, never growing, never being challenged, always taking the path of least resistance. But what can’t be changed, can’t be changed. To kick against a wall that can’t be knocked down is only to bloody ones toes. It seems to me that a lot of people are constantly bloodying their proverbial toes. We could all learn from your insight here! Thanks for sharing it, Nea! Thank you for your kind words. Sounds like your dad is a kindred spirit! There’s just so much in life to learn as we bounce off the walls and stumble and fall along the way. So, did his motto stick? Did it affect how you viewed life’s events over time? I like to think my use of that phrase sunk down somewhere in my daughter’s heart, but never directly asked, come to think of it. So I guess I’m just curious about your dad’s words in your life. Again, thanks for your comment, Julie. Glad I was able to spark a cherished memory. Noch Noch | be me. be natural. recently posted … if I could choose a normal life, would I? Ah, our stubbornness. Useful to stubbornly keep going in the face of opposition and negativity from others, but so often a huge obstacle to awareness and discovery and growth. You’re so right to point out the power these mottos have to dissolve a degree of that stubborn refusal to learn and live. Thanks Noch! Hope you have an awesome week! And I mean it in the way that, whatever happens, I get to choose how I react. Therefore I am responsible for my reaction, no matter what happens. Just dropped by to respond to a new comment and found yours sitting here gathering dust. So sorry for missing it. I love your motto: “I am responsible.” Some would see that as burdensome and overwhelming, but it’s actually such a liberation from the shackles of being acted upon and pushed around by the forces of nature, genetics, others’ moods or whatever. “I get to choose how I react” is well said, Demian. Thanks so much for adding that motto to the list. Well chosen! Thank you so much for being real.So what? Like George Bernard Shaw puts it “It takes allasorts of people to make a world”. I am but just one sort ,so what life goes.Thank you for helping me realise how much of my precious time I waste whining over things I cannot change but have to tolerate! Keep rolling them pal. It’s so easy to do! It requires an act of will to stop and an act of will to move our thoughts to ways of solving problems instead of complaining about them. Then another act of will to begin the process of actually doing something about it. And then living in a culture that encourages it and makes sitcoms that humorizes (probably not a word, but I like it) it, our complaining tendencies just get reinforced. Keep coming back for mental and emotional reinforcements on that journey to a complain-free life of amazingness!